Does hail affect all houses the same way? No, even the house next door can be impacted differently. How big can hailstones get? 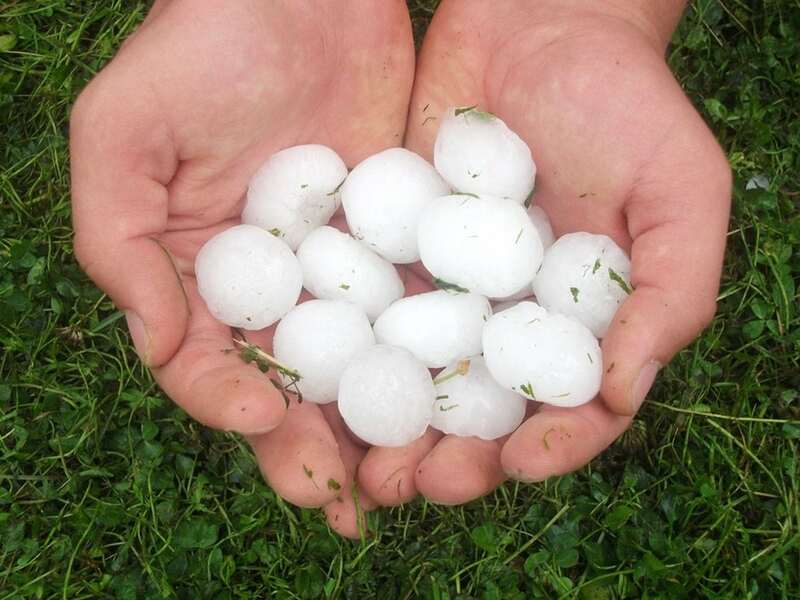 The largest hailstone ever recorded was in Vivian, SD, 2010. It had an 8-inch diameter and weighed 2 lbs. Is it normal to have granules from my roof shingles in the gutters or on my driveway? Yes. The normal weathering process of composition roofing shingles cases most granule loss. Can individual roof shingles be repaired/replaced? Yes. A reputable roofing contractor can remove individual roofing shingles and replace them with new shingles. Hailstones can vary widely within a small locality. Your property may be shielded from hail depending on wind direction. Roofs with a steep pitch will have less damage. Cover broken window with a tarp or plastic as soon as possible. 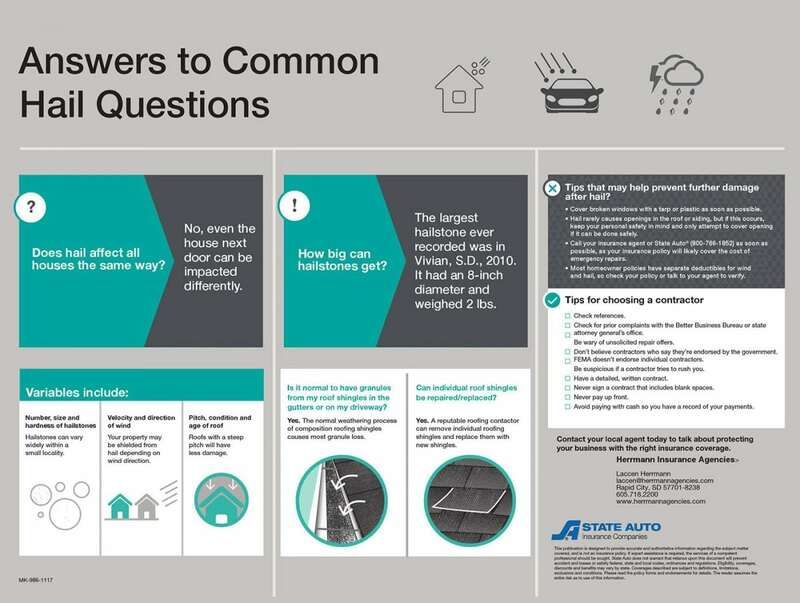 Hail rarely causes openings in the roof or siding, but if this occurs, keep your personal safety in mind and only attempt to cover opening if it can be done safely. Call your insurance agent or State Auto (800-766-1852) as soon as possible, as your insurance policy will likely cover the cost of emergency repairs. Most homeowner policies have separate deductibles for wind and hail, so check your policy or talk to your agent to verify. Check for prior complaints with the Better Business Bureau or state attorney general’s office. Be wary of unsolicited repair offers. Don’t believe contractors who say they’re endorsed by the government. FEMA doesn’t endorse individual contractors. Be suspicious if a contractor tries to rush you. Have a detailed, written contract. Never sign a contract that includes blank spaces. Avoid paying with cash so you have a record of your payments. If you have any questions about our services, want to meet with an insurance agent, or would like a quote, please contact our Rapid City office. We look forward to helping you.